I’ve blogged about pickles before. How could I not? I love pickles. I plant pickling cucumbers only every other year, to prevent me from becoming the Crazy Pickle Lady, but this year is a pickle year. Our favourites, without question, are dills. I made seven quarts of dills last weekend, and this weekend I put up another nine quarts. Plenty more to come before I’m finished pickling. I can most of my pickles in a water-bath canner, so they last two years. But the canning process leaves them less crisp than I like, so I also make fresh pickles to eat right now. They’re crisp and sour, and super easy to make. Combine vinegar, water, salt, and sugar in a saucepan. Tie the spices into a cloth bag (or use a stainless-steel tea ball) and drop it into the vinegar mixture. Bring to a boil, then lower the heat and simmer, covered, for 15 minutes. Shortly before the vinegar is ready, fill your jar with hot water (from the tap is fine, but make sure it’s as hot as you can get it). Let it sit for a few minutes, to ensure the jar is hot. This step minimises the risk of heat stress cracking the jar when you pour boiling liquid into it. When the jar is warm, pour out the water. Drop the dill, chilli, garlic and bay leaf into the jar, and then pack the cucumbers in tightly. 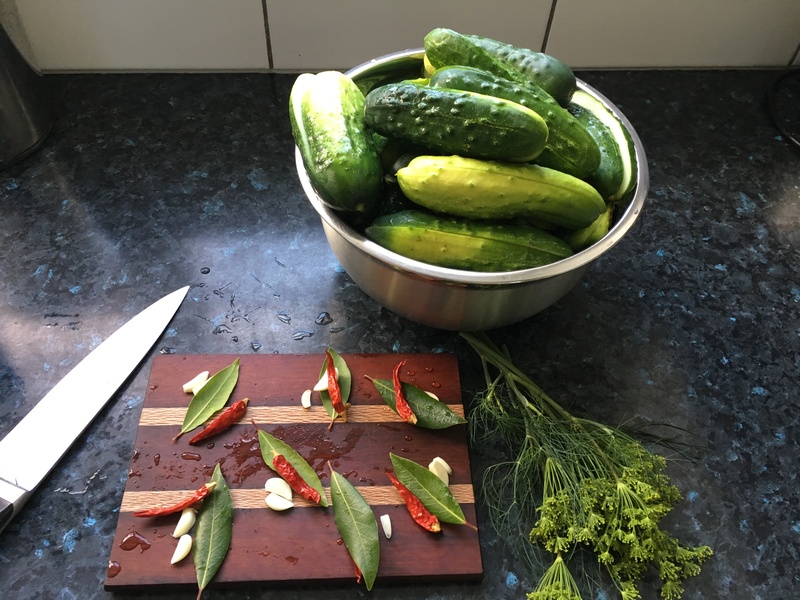 Try to arrange them so the cut sides are not pressed against one another—you want the pickling liquid to penetrate the flesh. Remove the spice bag from the simmering pickling liquid and pour it over the cucumbers, covering them completely. Allow to cool, and then store in the refrigerator for 3-5 days before eating. If you have leftover pickling liquid, save it in a jar, and just heat it up to make your next batch of pickles.